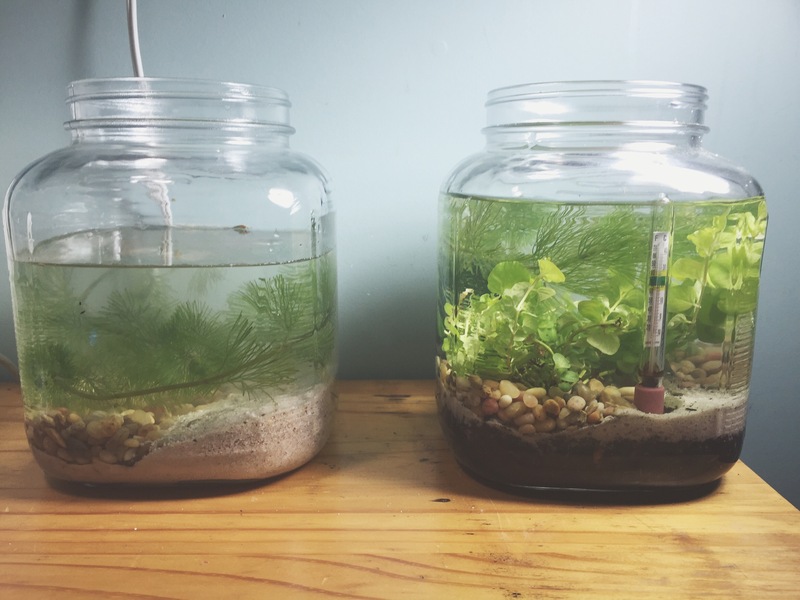 So after I set up the shrimp bowl I decided that if both were going to live on my desk that Trigy the Triops needed to be in a matching jar. And yes, I already owned these gallon jars. I took some of the aquarium gravel out of the critter keeper where he was hanging out and did a half-and-half gravel and sand floor. Triops sort through sand like shrimp, so I’d been feeling bad for him having all gravel. 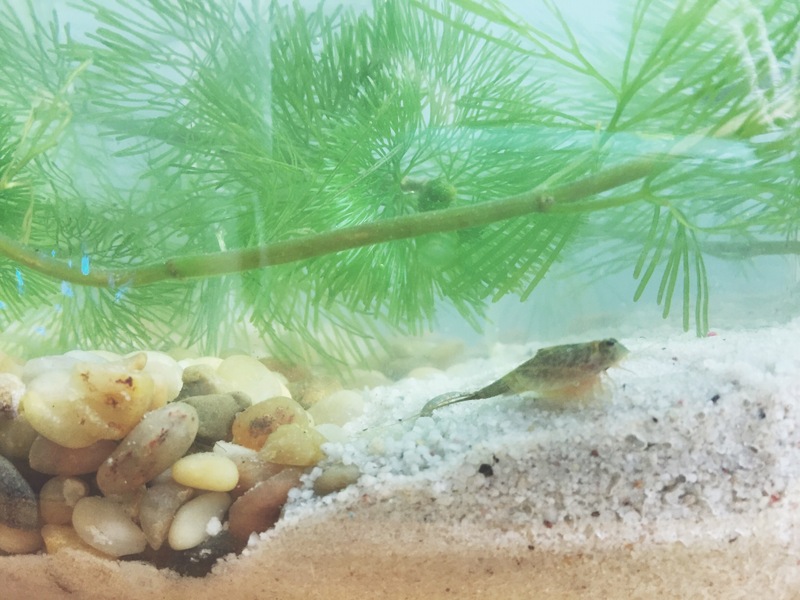 He’s been thriving regardless, mainly I think because he’s eaten all his tank-mates (fellow hatchlings and every other triops that hatched after him). Then I transferred some of his water, mixed it with some fresh, treated water, and moved the rest of the hornwort over. I only changed the water out once, so it’s still a little cloudy from the sand, but it will settle. His jar doesn’t look as pristine as the shrimp jar, but hey, they live in mud puddles in the wild. Trigy is somewhere between 2 and 3 weeks old, and is a little over 3/4 of an inch long (not including the long forked tail). If he keeps thriving he could live as long as 5 more weeks. 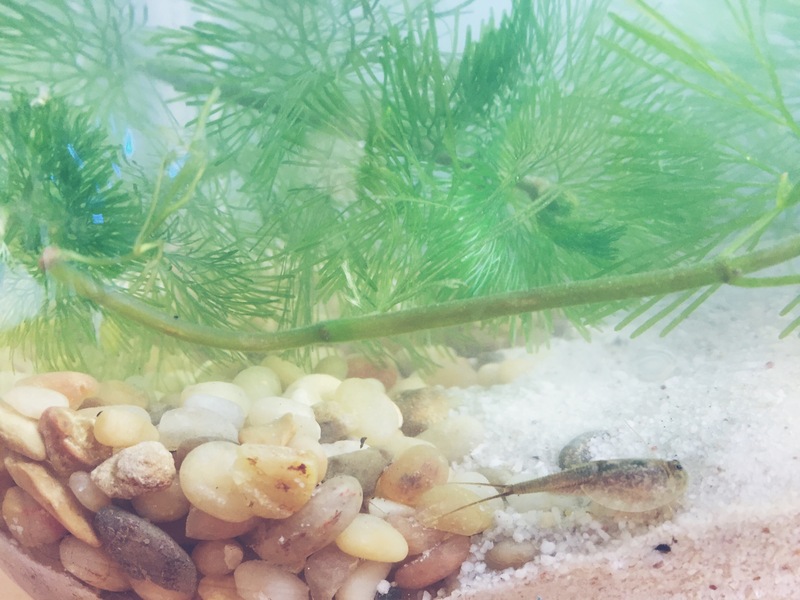 Technically this isn’t a Walstad bowl since nothing is planted, but Triops have such a short life, he’ll do just fine with a bit of floating plant life. Trigy came from the Smithsonian Prehistoric Monster’s kit that my five year old picked out himself with birthday money.